Take a Boat Tour with MDC! Get to know the Indian River Lagoon with the many boat ecotours offered by the Marine Discovery Center! You’re sure to encounter an array of wildlife including dolphins, manatees (seasonal), turtles, fish, and a wide variety of birds while cruising on our comfortable 40 passenger pontoon boat, Discovery. We invite you to join our certified naturalists on an adventure you’ll never forget. Explore your waters with MDC! Travel the Indian River Lagoon on our classic daily 2-hour journey with one of our friendly certified Florida naturalists who will share information about the lagoon’s wildlife through narration and hands-on specimens. 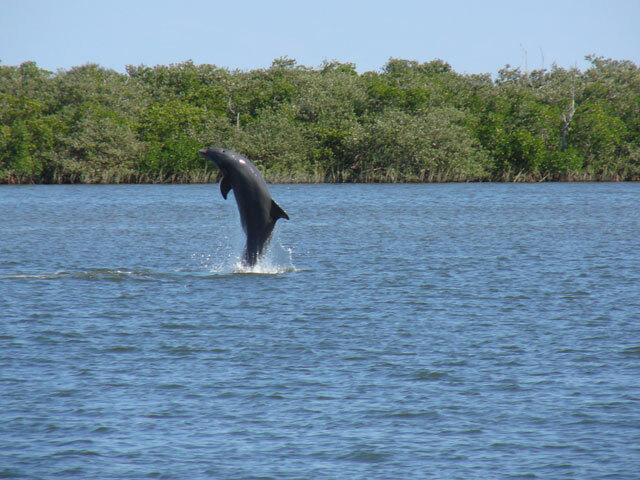 Dolphins, manatees, wading birds and sea turtles are often seen during these tours. As your captain skillfully navigates the backwaters of the lagoon, you will experience Florida’s natural beauty while learning about conservation efforts to preserve and protect North America’s most biologically diverse estuary. This special 2-hour evening cruise along the Indian River Lagoon allows you to view the fantastic colors of a Florida sunset. We’ll travel north past sand bars and by the U.S. Coast Guard Station while discussing the Indian River Lagoon and its flora & fauna – all the while scanning the waters and shorelines for birds, dolphins, manatees and other wildlife. The highlight of the trip will be watching the sun set over Ponce de Leon Inlet with a view of the Ponce de Leon Inlet Lighthouse. This Friday-only tour cruises under the New Smyrna Beach drawbridge, past sand bars, mangrove shorelines and through Ponce de Leon Inlet to the Ponce de Leon Inlet Lighthouse and back. Guests on this two-hour cruise often see dolphins, manatees, wading birds and sea turtles, which will be discussed by your guide, a certified Florida naturalist. This evening tour also may experience sunsets and roosting shorebirds settling into the mangroves for the night, offering excellent opportunities for photography. This special 3-hour tour will take guests on a journey through the Indian River Lagoon to experience wildlife from the water AND on foot. Begin your adventure with a boat ecotour narrated by one of our Florida Coastal Naturalists and have the chance to see dolphins, manatees, birds, and other wildlife. Soon you’ll have your chance to disembark onto a favorite local spot, Disappearing Island, where you’ll walk with a certified naturalist to learn more about the native coastal creatures that live in tidal pools, along shorelines and in native plants. Then climb back aboard the boat for a relaxing trip back to the dock. Come out for a spectacular 2-hour evening excursion on the water and watch the full moon rise from the comfort of our 40-foot pontoon boat, Discovery. Let one of our certified Florida naturalists teach you about the Indian River Lagoon ecosystem while you observe mangroves, birds, dolphins and more. As the sun sets and splashes vibrant colors across the sky, sit back and enjoy your view of the beautiful full moon as it rises over the horizon. Departs monthly during the full moon. Part ecotour, part history lesson – all fun! Take a cruise through history as guides from New Smyrna Museum of History introduce you to the city’s colorful, interesting past from the comfort of MDC’s 40 passenger boat, “Discovery.” This specialty boat tour is held on select weekdays each month. This special 3-hour tour on the Discovery boat will leave our dock and head north to Disappearing Island, where birding enthusiasts will disembark and spend two hours exploring this large sand bar, looking for winter migratory birds. Guidance will be offered to less-experienced birders and there will opportunities for novice birders to learn more about birds from highly experienced guests on the trip from local Audubon chapters. These depart monthly January through April. Planning a birthday, anniversary or reunion? Is your group eager to learn more about the Indian River Lagoon while cruising on your own private charter? Charter our vessel, Discovery, and you can choose from our standard cruise packages or let our team work with you to customize an outing which fits your needs perfectly. We can even arrange “Dock & Dine” excursions transporting your group to some of our local waterfront restaurants. Minimum occupancy (8) is required for all tours to depart.